grounded into letters on paper. freed into flight by wings. I'm sure that your daughter will love the card! Our daughter is home for the whole summer :) That will be a treat! 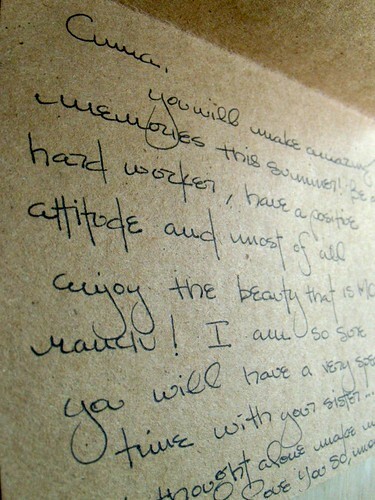 Handwritten notes are the finest gift! Exciting, isn't it, to see your little birds fly from the nest! Thanks for sharing so much beauty, Elk ... the links are amazing, too! I'm sure this was very special to her. sounds like a great summer for both of your girls. a very special time in their life. 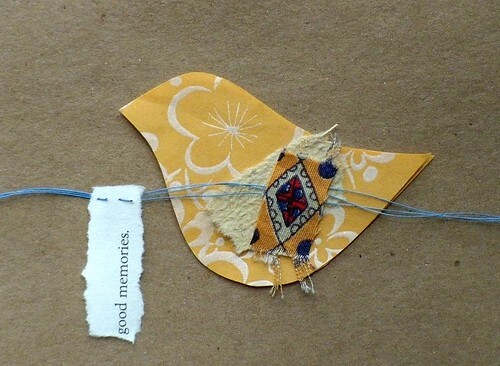 love this good memories bird. i am SO behind in blogging and being a good blogger friend. i've missed it. Love the colors on the bird. A surprise card in her suitcase...how wonderful, and something she will cherish I'm sure. Thank you always for the beautiful links. Happy weekend my friend! only five days?... and I was feeling down about how I only get 2 weeks with my oldest this summer. I am just completely floored by your handwriting. How special! It's simply lovely. very special gifts where you put your mind and heart. and it's nice that they'll be together - maybe you'll go visit? What a lovely, personal gift for your daughter, something she will treasure for many summers to come. really good idea to put a pretty and lovely card in the luggage. so much love with wings. Oh, that is so sweet! 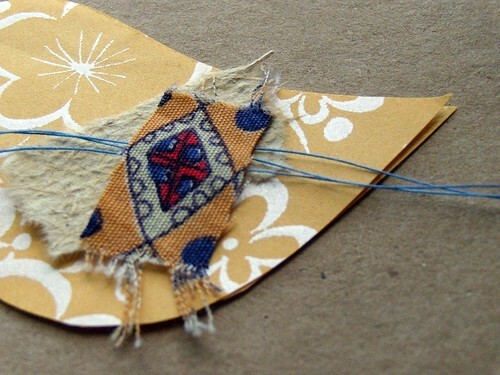 I love the colors and the pattern on that bird -- warm and beautiful. I'm sure both your daughters will have a wonderful summer! How great that your girls will be together for the summer! Beautiful! I love the writing. i think she'll treasure that as well as the fun memories ahead! Me too - I'm in this whirlwind of kids coming and going..packing and unpacking. All a part of the fun!!! i'm only on no.20, but i'm looking at the whole series of "bird word" and am LOVING it.